Situation on the contact line. On October 3, Russia-backed militants fired a Grad multiple launch rocket system for the first time since the so-called “school time” ceasefire came into effect. They fired 38 rocket-assisted projectiles upon the positions of Ukrainian troops near Talakivka (Prymorsky sector). Russian troops in Donbas. Ukraine’s Security Service confirmed the involvement of the private Russian military company called “the Wagner group” in the war in Donbas and in Syria. Mercenaries of this group took part in downing of a Ukrainian military plane IL-76 over Luhansk in 2014. The military group in question was set up in 2013 on the basis of the so-called “Svalyansky korpus” (the Slav corps) group. In spring 2014, the group was holding illegal activities in the interest of Russia in Ukraine’s Crimea, later it was fighting in Luhansk region and is currently taking part in the war in Syria on the Russian side. The group is headed by the Russian Reserve Lieutenant-Colonel Dmytro Utkin, call sign Wagner from which derives the name of the group. Until 2013 he was in charge of the 700th special forces unit of the 2nd brigade within the special forces of the Main Intelligence Directorate of the Russian Ministry of Defense. Members of the Wagner group were decorated with the Russian state awards based on the personally signed orders of the Russian President that were not officially published. 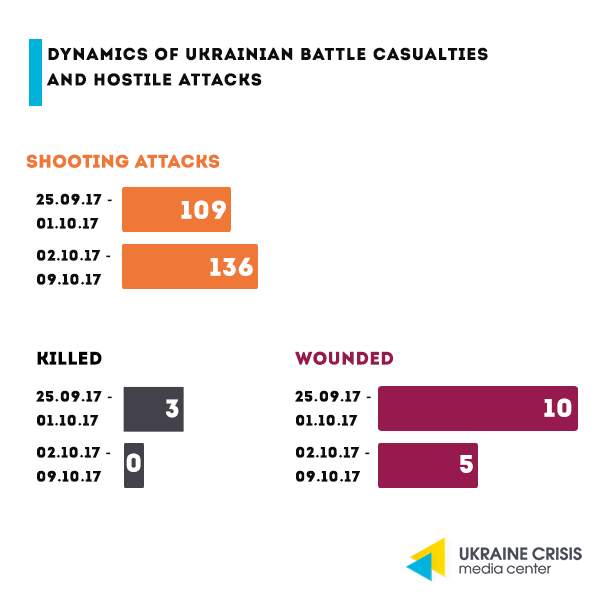 On October 7, Ukraine’s Security Service released a record of the phone calls made by the militant leaders in Donbas. One of the pieces contains a call between the “LPR” leader Igor Plotnitsky and one of the militant battalion commanders Andrey Patrushev, in which the latter said he had downed the plane. Another released piece is a phone conversation between the head of the “Wagner group” Utkin and the Major general of the Russian Federation Armed Forces Yevgeniy Nikiforov (call sign Tambov). The Security Service also discovered that the mercenaries of the “Wagner group” eliminated the unwanted militant leaders in Donbas. The group was involved in the murder cases of “LPR” leaders Aleksandr Bednov and Aleksey Mozgovoy. OSCE. Militants keep impeding the work of the OSCE mission. Thus, on October 5 they did not let the OSCE patrol cross the contact line near Novotroyitske, Donetsk region. Last week the OSCE Special Monitoring Mission to Ukraine registered self-propelled howitzers, tanks and artillery in the occupied territories, the mission report of October 3-4 says. What do the latest bills on Donbas passed by the Parliament change? On October 6, the Verkhovna Rada adopted two very important laws on Donbas: law 7163 “On the Aspects of State Policy of the Restoration of Ukraine’s State Sovereignty over the Temporarily Occupied Territories of Donetsk and Luhansk Regions” and law 7164 “On Creation of Necessary Conditions for Peaceful Settlement of the Situation in Certain Areas of Donetsk and Luhansk Regions”. Long way to the adoption of the laws. On October 4, President of Ukraine Petro Poroshenko introduced to the Verkhovna Rada the draft law 7163. People’s deputies from the Samopomich faction initiated an alternative draft law 7163-1 “On the Aspects of State Policy of the Restoration of Ukraine’s State Sovereignty over the Temporarily Occupied Territories of Donetsk and Luhansk regions.” On October 5, the Parliament put the draft laws on the agenda and decided to consider them the same day, but failed to do this because opposition deputies (in particular, the Samopomich faction) blocked the Parliament rostrum and the presidium. The MPs from Samopomich demanded, among other things, that the provisions concerning the Minsk agreements should be excluded from the text of the Presidential draft law 7163, and also that the draft law should specify the dates of the occupation of Donbas and include the issue of the annexation of Crimea. Head of the Parliament Andriy Parubiy, after consulting with the faction chairmen, informed that an agreement had been reached on the exclusion of the provisions of the Minsk agreements from the draft law. The voting began on the morning of October 6. Draft law 7164: What conditions for peaceful settlement of the situation it provides for? This Law introduces a special procedure for local self-government in certain areas of Donetsk and Luhansk regions, including districts, cities, towns, villages, as determined by the Parliamentary decision. The law establishes that a special procedure for local self-government in certain areas of Donetsk and Luhansk regions comes into force only after all the conditions set forth in Article 10 of the law have been fulfilled, in particular, with regard to the withdrawal of all illegal armed formations and their military equipment, as well as militants and mercenaries, from the territory of Ukraine. The article stipulates that the elections should be held with the participation of impartial international observers, in particular from the OSCE Office for Democratic Institutions and Human Rights, the Congress of Local and Regional Authorities of the Council of Europe, other international organizations and foreign states, as well as official observers. Among other stipulations are guarantees of free expression of will and secret ballot, electoral rights of IDPs who were forced to leave their places of residence in certain areas of Donetsk and Luhansk regions; transparent counting of votes, the establishment of general and local election results. Draft law 7163: What are the special aspects of state policy ensuring the state sovereignty of Ukraine? The document defines the temporarily occupied territories in Donetsk and Luhansk regions as: the land territory and its internal waters within the limits of separate districts, cities, towns and villages, where the military forces of the Russian Federation and Russian occupational administration have established and carry out the occupying government and general control. The boundaries of the temporarily occupied territories in Donetsk and Luhansk regions are determined by the Ministry of Defense based on the proposal of the General Staff of the Armed Forces of Ukraine. The boundaries of the temporarily occupied territories in Donetsk and Luhansk regions are determined by the Ministry of Defense based on the proposal of the General Staff of the Armed Forces of Ukraine. The draft law states that the activities of the Russian military and the Russian occupation administration are illegal, and any act issued in connection with such activity is invalid and does not create any legal consequences. In addition, the document contains a number of provisions regarding the state of martial law. Discover more details in UCMC’s materials: “What do the latest bills on Donbas change?” and “Heated discussion over the draft laws on reintegration of Donbas”. Four new arrests in Crimea. In the Russia-annexed Crimea, law enforcement arrested four Crimean Tatars. Three arrests – of Renat Suleymanov, Arsen Kubedinov and of Seyran Mustafayev were reported by lawyer Edem Semedlyayev on Facebook. He claims that Suleymanov was taken in the unknown direction by the masked men. They were moving in service vehicles with no number plates. Another abduction was reported by lawyer Mammet Mambetov on Facebook. The lawyer elaborated that the search was conducted by the Federal Security Service (FSB). The European Parliament calls on Russia to secure the access to Crimea for international organizations. Respective resolution was approved by the European Parliament on October 5. The European Parliament also called on the EU Special Representative for Human Rights to constantly monitor the human rights situation in Crimea. The document also re-confirms the position of the European Parliament in support of Ukraine’s sovereignty and territorial integrity within its internationally recognized borders as well as condemns the Crimea annexation. Education reform: awaiting the assessment by the Venice Commission. Following the heated international reactions upon the adoption of the education law, President Poroshenko tasked the Foreign Affairs Ministry and the Ministry for Education and Science to hold the necessary consultations with the European partners including the Council of Europe. Dmytro Kuleba, Permanent Representative of Ukraine to the Council of Europe, wrote on Twitter that “the experts of the Council of Europe gave a positive feedback on the Ukrainian education reform. Waiting for the opinion of the Venice Commission as to the Article 7”. Check out UCMC’s material “The new law on education: why is Ukraine compelled to turn to the Council of Europe?” for more details. Pension reform. On October 8 President Poroshenko signed the draft law no.6614 “On amending certain laws on the pension increase”. To remind, the pension reform was approved by the Parliament on October 3, 2017. According to the document about 9 million retired persons will be getting increased pension payments effective October. The reform foresees a series of changes to Ukraine’s pension system: check out UCMC’s material “New pension reform: what it suggests” to learn more. The Festival of Audiovisual Art Tetramatyka-2017 starts in Lviv. Why is it worth of attention?The event is a grassroots initiative founded by a group of Ukrainian media artists who are working with sound and visual art. Participants’ geography also covers the neighboring Poland. The festival has the potential of becoming the Eastern European analog of the renowned Ars Electronica. Which events are must-see? The sound of Industrial Lviv. As part of Anton Logov’s project “Future Perfect” audio tracks will be broadcast in the FM format on a series of industrial sites of the city – remains of factories and depots, thus creating the urban audio landscape. Ukraine in the context of the European media art. The curatorial group of the Open Archive of Ukrainian Media Art is to present the project “Metoda” on the Berlin-based duo akuvido founded by the graduates of the Lviv Arts Academy and recognizable in the European media art space. Part of the festival’s program comes also the “Kein Name” exhibition by the Polish video artist Miroslaw Balka. Check out the festival’s web site for further details. The Guardian released the short film “Home Games” by Ukrainian film director Alisa Kovalenko. The media supported the film production as part of the Guardian Goes Ukraine project. The documentary tells the story of a 20-year-old female football player from Kyiv. Film info. Ukrainian athletes win two silver medals at the artistic gymnastics world championship. Ukrainian athletes Ihor Radivilov and Oleh Vernyayev won two gold medals at the world championship for artistic gymnastics that is running until the end in Montreal, Canada. World records in diving. Ukrainian athlete Natalia Zharkova won two gold medals at the European championship in Turkey. 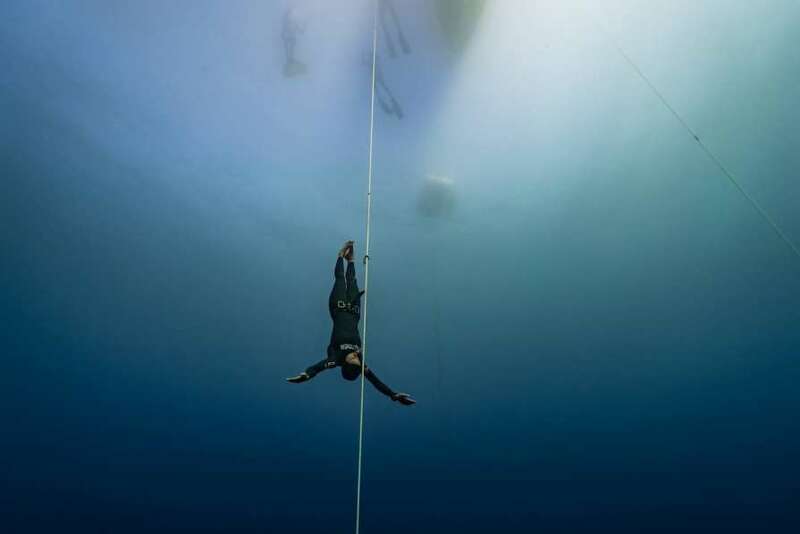 Both results that Zharkova demonstrated became the new world records according to the CMAS version (constant weight diving without fins and in bi-fins).